Born in Quebec, Canada in 1915, the young Saltzman had little education before extraneous circumstances saw Harry abandon home and join the circus. Since then, Saltzman would never talk of his mother and his children would never know their grandmother. In his teens, Harry's entrepreneurial spirit and passion for the stage led him to be a talent manager in Long Island's Vaudeville strip and by age 17, Harry had arranged his own circus troupe back in Canada again. During the 1940s, Saltzman joined the army, serving in World War II. He was posted to Paris, France where he liaised with the RAF and later was recruited to the OSS - the Office of Strategic Services, an early effort at an Allied unified intelligence force. After the war Harry stayed on in Paris and here he met his bride-to-be, Jacqueline: a Romanian who had escaped from the troubles of her homeland. In Paris he found work as a casting agent in show business and became a reliable name in the Paris cabaret scene. Despite his familiarity within the industry he failed to make any real money and family and friends recall Saltzman moving from one free house to the next, never having enough to afford his own lodgings. In 1956 he was heavily involved in the production of "The Iron Petticoat", contributing to the writing staff as well as producing the picture. This film was a Bob Hope comedy that co-starred Katharine Hepburn and Robert Helpmann. Next, together with Tony Richardson and John Osborne, Saltzman formed a production company with the hopes of being able to find finance for more features. They called the collaboration Woodfall Productions and Harry finally found his real passion. 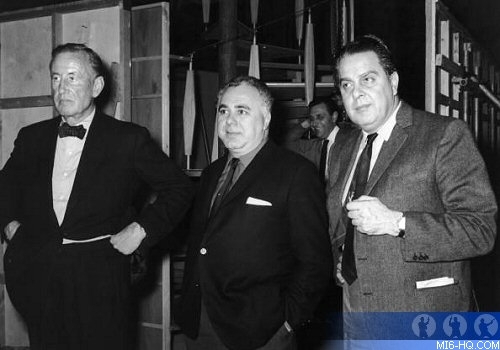 The trio collaborated on Saltzman's next credit, the successful "Look Back In Anger" (1968). Woodfall took their production to the UK and cast famed Welsh star Richard Burton as the lead, whilst Richardson was in the director's chair and Osborne (having written the stage play) collaborated with the film's screenwriter Nigel Kneale. "Look Back in Anger" earned the producers a Golden Globe nomination. Family recalled that his enthusiasm for the theatre lead Saltzman to seek out various stage plays he thought fitting to put on screen. He was passionate about plays and wanted more people to see them. However, as the new medium was very much motion pictures, he compromised, bringing some excellent stage plays to the screen. Woodfall would follow their success on "Look Back In Anger" with "Saturday Night and Sunday Morning" (1960), a Karel Reisz helmed picture. Set in Nottingham and starring a young Albert Finney, the film scooped three BAFTA awards, including Best British Film in at the 1981 awards ceremony. The same year, the trio of aspiring filmmakers produced "The Entertainer" - sometimes regarded as Laurance Olivier's greatest performance, the film saw Finney and Olivier play leads, together with Joan Plowright and Alan Bates. "The Entertainer" was nominated for an Academy Award - best actor - as well as a series of BAFTAs. Despite the critical acclaim the productions Saltzman had worked on eared very little at the box office and in the early years of starting a family with wife Jacqueline, the Saltzmans were finically challenged. When the Woodfall productions team parted ways, Saltzman looked for a solid investment, turning this time to the successful series of novels by Ian Fleming. It was after reading Fleming's "Goldfinger" that the producer made a daring move in acquiring the screen rights to James Bond. Yet it would take some time before Harry could make James Bond an on screen reality, and therefore, his newest acquisition was unquestionably risky. Saltzman reportedly paid $50,000 for the rights in 1961, a huge sum for the times and his pricy offer earned him just a six-month option on the James Bond character. 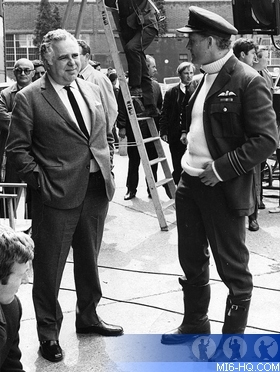 At the same time, Albert R. ‘Cubby' Broccoli was looking for a new, long-term project and had already approached Ian Fleming for the rights to produce his spy adventures. Time and time again Broccoli was told they were unavailable but the producer persisted, to the point of approaching Saltzman with a generous offer. It was Wolf Mankowitz - the screenwriter that would earn the job of penning an early draft of "Dr. No" - that ultimately put the two producers in contact. In the end, Mankowitz bowed out of the project shortly after preproduction began and his early treatment was replaced by the work of Richard Maibaum. Everyone who knew the soon-to-be famous business partners swore they were completely contrasting personalities, both with contrasting business styles. But with Cubby determined to make James Bond pictures, and Harry unwilling to onsell the option, they came to an agreement in the form of a business partnership. Both were determined, focused and business savvy producers who saw a great potential for on screen magic in James Bond. And even after Harry departed the Bond scene, Cubby still spoke highly of his partner. His daughter, Hillary Saltzman later told the presses that her father had a huge admiration for the work of Ian Fleming, and it was this awe that helped seal the deal between Ian, Cubby and himself. The pair formed Danjaq S.A., the company responsible for the rights to the James Bond pictures - named after Dana (Cubby's wife) and Jacqueline Saltzman. The more famous EON Productions was created shortly after the confirmation of their partnership and to date is a subsidiary of Danjaq, responsible for making the pictures themselves. With the legalities finalised, Broccoli and Saltzman set about finding a reputable studio to finance their first James Bond picture. Artists (a subsidiary of Metro-Goldwyn-Mayer) who had approached Fleming to find the screen rights to Bond unavailable. It is not surprising that when the newly formed Danjaq approached UA (United Artists), they were able to come to an arrangement to produce "Dr. No" as the first James Bond adventure. UA fronted the $1 million budget for the debut 007 production and Harry and Cubby set to work, looking for a man to play James Bond. 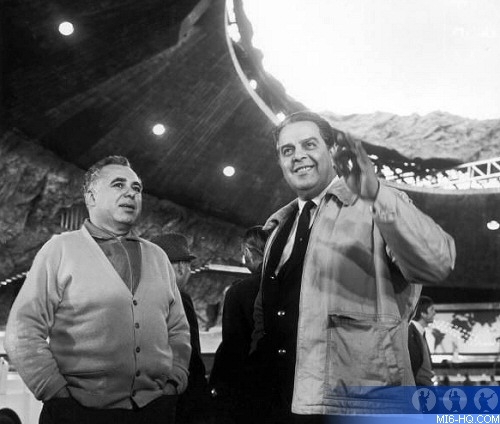 Above: Ian Fleming, Harry Saltzman and Cubby Broccoli on the set of "Goldfinger"
After "Dr. No" was in the can, Saltzman and Brocolli worked together on their one and only non-Bond collaboration, "Call Me Bwana" (1963). The pair's initial deal with UA had stipulated the production of one non-Bond film for every 007 flick the duo produced. "Bwana" was an African set comedy starring Bob Hope and cementing Saltzman's relationship with various filmmakers who would go on to work with him on multiple James Bond productions, notably Ted Moore, Peter Hunt, Syd Caine and John Stears. Between 1960 and 1965 Saltzman became a financially successful producer, as well as a critically acclaimed one. He was one of the big ideas-men behind many of the classic James Bond sequences loved by fans today. Family and colleagues reported that he was always on the go - when he wasn't on the set, supervising the Bond pictures, he was at the drawing board, planning the next big project. With his new found wealth he was able to treat his family to a few luxuries and himself to fine food and outrageous, if expensive, clothing. Saltzman and family invested in a family home, to be known as Woodlands Park, and he would host potential Bond cast members in order to get to know the people he would have to work with. At the family home Saltzman even had two German Sheppard dogs, one he named James and the other Bond. For nine successful James Bond productions, the two extremes of Cubby and Harry worked together to create mind-blowing, successful adventure films. The pair saw the departure of their first 007 actor, Sean Connery, and Harry worked closely with George Lazenby to prepare him for his starring role in "On Her Majesty's Secret Service". According to some reports Harry came close to slashing three soon-to-be successful James Bond title themes. Both "Goldfinger" and "Diamonds Are Forever" met with the producer's disapproval but were never replaced as he was out of time and money to commission backups. In the case of latter, veteran 007 composter, John Barry convinced the producers to go with Shirley Bassey's belter. Beyond Bond Harry continued to produce a variety of pictures, including the Harry Palmer series, starring Michael Caine. The string of cold-war spy thrillers began with "The IPCRESS File" in 1965 (between "Goldfinger" and "Thunderball"), followed by "Funeral In Berlin" (1966) and "Billion Dollar Brain" (1967). Saltzman also had a hand in the quirky Orson Wells War drama, "Campanadas a Medianoche" (1965) and Guy Hamiton's "Battle of Britain", which was packed with stars of the day, including Michael Caine, Ian McShane, Laurance Olivier, Chistopher Plummer, as well as Bond alumni Curt Jurgens and Robert Shaw. By 1975, Saltzman had run a string of unsuccessful non-Bond productions and had found himself met with some financial difficulties. In order to recoup his losses he had no choice but to sell his Danjaq shares to his partner Cubby; the deal was struck for an impressive $20 million. 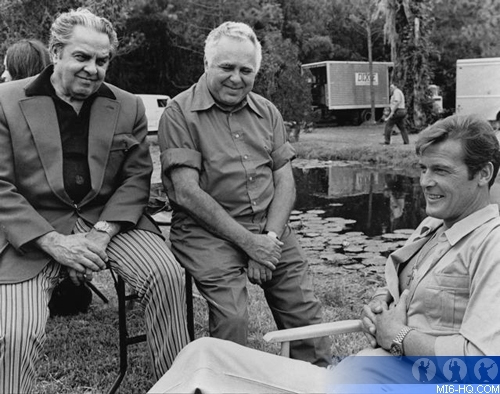 The 1977 production, "The Spy Who Loved Me" saw Broccoli working alone for the first time to produce James Bond. To add to Saltzman's troubles his beloved wife Jacqueline had recently been diagnosed with cancer and shortly after his stepping down from the Bond team, she passed away. As of "The Man With The Golden Gun", Harry Saltzman took a hiatus from producing to look after his ill wife and selvage his financial position. The old partners had not parted on the best of terms but when, at Topol's suggestion, Cubby invited his long-time producer friend to the premiere of "For Your Eyes Only" (1981), they rekindled a friendship. Other than occasional visits to the UK, Harry retired to Florida to see out the rest of his life, only being coaxed out of retirement to produce two further pictures after "Golden Gun". One was an Alan Bates semi-biographical flick, based on the life of Vaslav Nijinsky, the aspiring choreographer. His final Producers credit was on the 1988 production of "Dom Za Vesanje", an Italian-set film about a gypsy with telekinetic powers. The film won a range of awards including Best Direction at the Cannes Film Festival. 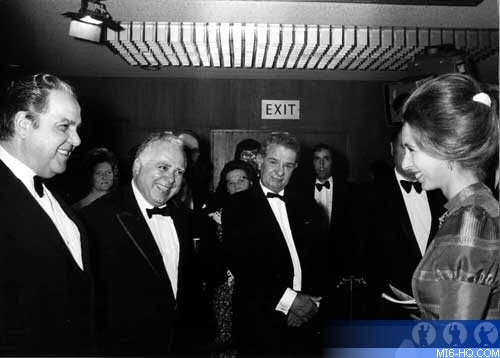 Harry Saltzman ultimately passed away on 28th September 1994 in his favourite city: Paris. He is survived by three children and a sister as well as his massive legacy: the on screen James Bond adventures.